There were so darn many off-the-field heroes in Philadelphia on Sunday that it's nearly impossible to count them all. 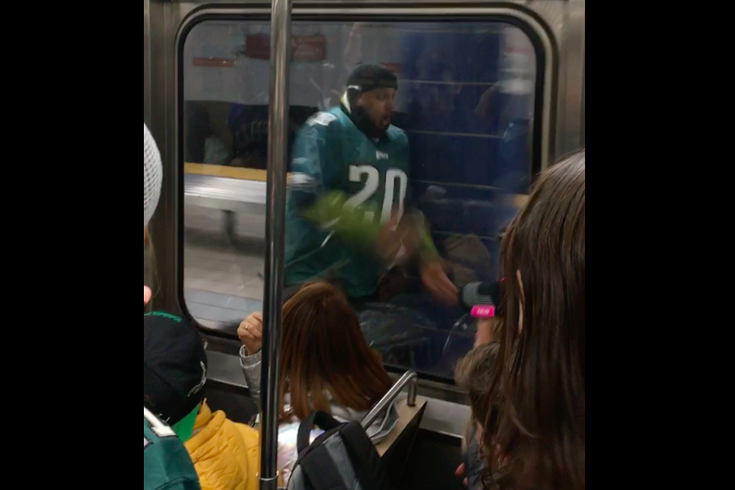 With all due respect to the "Go Birds" dude and his skydancer-balloon stance and the greased-pole climbers, the big fan in the Brian Dawkins jersey who got dropped by a SEPTA platform pillar takes top honors. On Monday, we brought you footage of the aforementioned magical moment – from several angles no less – in the pursuit of information about The Pillaring. In it, we determined that the fellow wasn't trying to jump on the train, that the train in question was heading northbound and that the passengers quickly got back to drinking and cheering for the Birds after seeing him get taken out. What we didn't determine was the identity of the gentleman and information about his history. Well guess what: That all changed thanks to the magic of virality. Jigar Desai is a pharmaceutical company employee who has Lancaster-area roots. Desai – whose Facebook profile picture features his two young children rock climbing, one wearing a Phillies hat and the other an Eagles lid – was kind enough to call Tuesday morning to discuss what had happened and the ramifications of such viral fame. He talked about being "a 10-pound baby born in India who grew up an Eagles fan" after his family moved to the United States when he was very young. The family lived in Chicago and Lancaster, where a love of the Birds overtook him, even though his family wasn't as into football as he was. "I picked it up watching Randall Cunningham back in the day. Just fell in love with the team," said the 42-year-old married father of two sons, ages 8 and 6. "I lived in Pittsburgh for 10, 11 years and in North Jersey. I represented the Eagles everywhere, even taking the PATH train into (New York) City." He recently moved to Lower Gwynedd, Montgomery County: "I thought I'm finally home." He mentioned that his "arm is bruised, my shoulder and left chest area hurts a lot, but I feel a lot better today than I did yesterday and hopefully that continues tomorrow." Then, he graciously fielded our questions about The Pillaring. So, what had your day been like up until that point? We were pre-gaming at my brother's place in South Philly. I got there around 10 a.m. We started (drinking) around then, mostly beer but then we moved on to bourbon after that. We watched the Jacksonville/New England game and then headed to the subway station. There was initially a lot of misinformation out there, people saying we were heading home after the game, but we were waiting for one going south and that one (in the videos) was heading away from the stadiums. When the second video came out, it was humbling. I saw how bad things could have been. How'd your day go from there? Painful? Numb? Well, it happened. I bounced back up, gave some people high fives, went to the Linc and enjoyed the game. Nobody said anything to me about it during the game. There was an incident and we moved on from it. The Linc was rocking. The game was awesome. Then, when we were leaving the game, right when I was getting back to the Broad Street Line actually, I started getting texts from friends. "I think you're famous now." "Is this you?" I said it probably wasn't me, but then when I saw the video, I thought, "Oh dear God, that is me." I saw a lot of comments. People were saying they watched it 500 times and couldn't stop. I probably watched it 500 times myself. But when I saw that other angle, I thought, "Wow, this could've been really bad." I'm very fortunate and lucky to have made it to the game. Dawkins would have taken that pole out. I tried to do my best Dawkins impression and failed, but hopefully, I made him proud. And, hopefully, he gets into the Hall of Fame this year, too. What valuable life lessons did you learn as far as riling up fellow fans with this magical moment in time? The passion will always be there, but maybe I could bottle it up a little bit, pace myself a little more while pregaming and save all that energy until I get to the stadium. I want to move forward that way. Hopefully, I brought a lot of laughs to people all over the world. I think we all need to laugh more, and my friends are having a great time with this. My wife and I haven't shown the kids the video yet. I want to be a good role model, but the lesson here is that these things can get recorded and is this how you want to represent your passion? When we tell them in 10 years or something, we'll have a good laugh, though. What's it like going viral – and being widely hailed as a hero – because of suffered pain? Well, it's not the way you plan to go viral, but I have to say I'm relieved that I'm getting an overwhelming amount of support. The guys who videotaped it told me they'd lost their tickets, actually, and they were kinda down but when I came up to the windows and they saw me, they thought they were looking at Dawk. They said it reenergized them. NFC Championships don't happen all the time here. Eagles are underdogs. The Eagles fans are underdogs with people loving to bring up the bad stories about us. But we're good fans who just want to bring the hardware home and experience a championship. I wouldn't change a thing about what happened, other than staying away from moving trains. OK, what's your prediction for the Super Bowl? We'll take it to Patriots. Not surprisingly, we're underdogs again. It feels really special this year. Doug Pederson has done a hell of a job with the injuries, after losing their left tackle, running back, quarterback for God's sake, Jordan Hicks. If the Eagles play like they've been playing, I see a 31-17 victory.